So the question was posed to me, “Why do you choose to carry, as a young college-aged woman?” Well, that is quite the story for me. I’m not going to give you some sheep-dog version of wanting to change the world by toting a gun around or of having vivid dreams of shooting a bank robber center mass from across the room. Don’t get me wrong, I'm willing to step up to that plate, but my story does not start there. I never grew up around guns. My parents never went hunting, so we did not have venison stashed in our freezer like most Wisconsinites. I did, however, grow up playing in my dad’s automotive shop and spent my nights practicing gymnastics, tearing the skin off my hands and covered from head to toe in chalk. Needless to say, your typical “girl” was never something I identified as. Throughout high school I spent my free periods meeting with recruiters at school, discussing my ambitions, and exploring where I could possibly go in the future. I knew it was my mission to join the military; my hours of gymnastics and various other sports had physically prepared me. But what about my mental fitness, was I prepared? How do I shoot a weapon? Can I spend that length of time away from my family? Ultimately, I wanted answers to these questions and decided to be one of the first in my family to go to a four-year college: the University of Wisconsin-Madison. The summer before leaving I started to date my longtime friend, J. I thought my life was perfect until the first few weeks flew by; I knew I was missing something I needed in my life. I was lacking my competitive edge, my strength, and the ability to overcome things that were seemingly impossible. Soon after my first semester had ended at UW, I enlisted in the Wisconsin Army National Guard. My then boyfriend had started to show me various shotguns up at their family’s cabin and was the first to teach me how to shoot a rifle. That July, I left for basic training and AIT, and would return in December. Much had changed within me. School now seemed so irrelevant to my life. I thought everyone around me was too worried about themselves and their grades. I was too in touch with other things going on in the world. I was completely invested in my relationships but expressed my worries too bluntly. I had become more aggressive in my everyday life and my significant other was far from the man I once knew. During my time back in Wisconsin, I had become more invested in the military life. My workouts remained prevalent while studying did not. 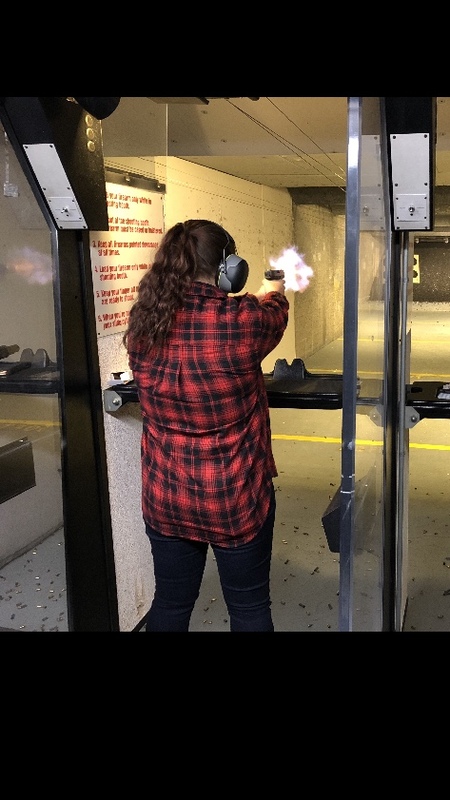 The shooting range back home became our usual “date night.” We both became very interested in firearms: myself infatuated with ARs and J pistols. Throughout our spring semester both J and I had started to fall apart. I sought out help while also recommending it to him. I was able to get myself into some kind of regularity without my vigor of military life. But he resisted. But soon I was returned to active status for my first annual training. Throughout this time I was able to build life-long relationships with some of my peers as well as my leadership. I came back from a fruitful training with a promotion and an AAM. I however, returned after 3 weeks to an even more broken boyfriend. After some aggressive nights, I decided to walk away for my last time. I moved out of the apartment we had shared together and went to live with my summer job co-worker. About a week later I came home to find out my then ex-boyfriend died by suicide with a Glock he had purchased earlier that day. I was lost in grief and decided to blame the gun. I swore off any firearm in the moment, forgetting about annual qualifications. However, my first time on the line during zeroing I broke down and cried. With confused sergeants all around me, a medic came to assess the situation and escorted me away from the range. I explained my past and the medic calmed me down. I ended up making it through zeroing and immediately qualified to finish out the day. In the weeks to come, that medic reached out to me. He was a qualified firearms instructor and asked to take me to a range if I felt comfortable. By walking me through mag changes and other drills I finally felt comfortable with a firearm again. It took meditative breathing techniques to calm my mind and my hands from shaking. It was a power no one could take away from me. The adrenaline rushed, and I immediately felt free. I owe my return to shooting to him. I was able to overcome my past and feel even more comfortable with pistols and rifles than I have ever been before. I began to associate trigger squeeze on both ARs and pistols with meditative breathing. Before going to the range I meditated to get into a completely different headspace. This transformation has been rewarding, to say the least. But why do I carry? The calm I feel around weapons transcends any calm I can achieve on my own. Having the ability to respond to a dangerous situation is something I’ve trained for my entire life. With a myriad of medical and HAZMAT training under my belt, I seek knowledge and skills to help me protect others and myself. Let's look at this from an ability standpoint. If you are at a restaurant and someone goes into cardiac arrest, your body knows what to do. You have adrenaline rushing through you, you delegate and tell someone to call 9-1-1. But we all know calling for help doesn't always resolve the issue, one must act in the meantime. You assess the situation and decide to act. Checking airways and for a pulse. If you know what to do, you do it. So if you decide to save a life medically, why not act similarly in the presence of an attacker? Your body and mind act in sync. Adrenaline rushes, you act and save a life–either your own, or that of someone else. It is the feeling of “what if.” If a situation should arise in my presence, when I have the ability to act but am not capable; I would forever blame myself. I have the capability to respond to many situations, and I would never choose to turn my head or walk away. This is just part of my character and is something I’ve also been trained to do. The military ingrains acting into your being. One must act. I choose to act. I choose to protect those around me and myself. It could be me walking to my job at 4:45 in the morning. Maybe I witness someone around campus being attacked late at night. If I end up being so lucky as to one day have a family, I will protect them. However, I am not going to say I am a professional. In fact, I will always identify myself as a novice. There are so many techniques to learn and modifications to make on every single weapon. Combatives are something I strive to become more qualified in instead of relying exclusively on deadly force. Weekly practice is something I am able to do now with my weapon. I hope one day, I will be practicing daily on my own land. I hope to be as prepared as I could possibly be should that day come. But as for now my paper targets from the last year have shown my ability to shoot farther, in more consistent groupings, and with the accuracy I never had. Every day I think about my loss, but it doesn't have to be something that defines me in a negative way. It can be something that propels me further. The Gen 4 Glock 19 that sits in my AIWB holster may one day save someone else's life and I will always assume that responsibility. I think in some ways because of my past I was able to become the person I was meant to be. I am still the girl covered in chalk from the gym, just more prepared for life now.